The ideas I wish to describe are old ideas. There is practically nothing that I am going to say tonight that could not easily have been said by philosophers of the seventeenth century. Why repeat all this? Because there are new generations born every day. Because there are great ideas developed in the history of man, and these ideas do not last unless they are passed purposely and clearly from generation to generation. I’ve been thinking a lot about science lately – big important questions, like What’s The Point, Anyway? Public science in all four of these countries seems to be in the hands of people who, at best, completely misunderstand the nature of science, or at worst are actively trying to undermine it. For clarity in these troubled times – to seek confirmation you’re not the one who’s going mad – there’s one person you turn to. The wonderful, incomparable, Richard P. Feynman. This little book contains three public lectures Feynman gave in 1963 on the nature of science and its relation to other fields. It reads like you’re there listening to the speech: it’s conversational, concise, loaded with anecdotes and examples, and sometimes excited and tripping over itself. You can finish the whole thing in under an hour, I think. It’s easy and entertaining and brief. Yet somehow it contains and explains pretty much every fundamental principle of science. If I were teaching science and was only given an hour in which to communicate the things I thought most valuable, I’d teach from this book. Who cares about the exact equations for parabolic motion, really, when the important thing is to understand the ways of thinking that yielded them? Do you give a starving person a fish/formula, or teach how to find out for themselves whether something is true? The latter – the understanding of method, not of factoids – leads to critical thinking, judgements based on evidence not authority, openness and democracy. It helps us resist marketing spin, political propaganda and faulty thinking. The former – the learning of facts – moulds us into fact-accepting (or fact-fabricating) machines. Every serious problem I encountered as a science communicator arose because people didn’t understand the nature of science. Ignorance of facts can be dealt with in a 10-minute powerpoint presentation, but misunderstanding of the scientific philosophy leads to huge roadblocks in dialogue. Examples of this, from my direct experience: a member of the public telling me ‘of course you’d believe in climate change; you’re biased – you’re a scientist’. People within CSIRO too scared to comment on government statements about science fact (not science policy) because they’re unsure exactly where science crosses into policy. Researchers scared to speak plainly because they fear the public (and media) will misconstrue scientific concepts of ‘uncertainty’ as ‘complete ignorance’, or ‘theory’ as ‘guess’. High-level managers who believe the role of a public science agency is to assist international corporations for short-term profit. In the midst of this mess, Feynman’s voice cuts through cleanly and clearly, and helps us find our feet. So we can prepare to kick the bad guys in the nuts, that is. Regarding technology – it is neither good nor evil. It is a key that can open both the gates of heaven and hell. How to work the key is a scientific question. Whether to use it, or how, is not – it is a humanitarian question. Regarding knowledge – its value does not lie in whether it can make us profit, or even whether it can cure cancer. Its value is that we learn about the amazing world we are part of, and get to know ourselves. Regarding method – the whole principle of science is that ‘observation is the ultimate and final judge of the truth of an idea.’ A scientist always tries to prove him or herself wrong as quickly as possible. Anything that cannot be tested by observation falls outside of the realm of science, including many of our most important questions about life. When science develops a way to do that thing in Gulliver’s Travels where mathematicians learn by swallowing pages of textbooks, I’m going to turn this chapter into a papery rice cake and shove it down a lot of important people’s throats. It’s wonderful watching Feynman show how it’s possible to be uncompromising about the scientific philosophy and still treat people of differing beliefs with respect. People who are sincerely trying to understand the world in good faith, that is. He addresses the issues of science and religion and points out three different aspects of religion – metaphysical, which brings conflicts with science (how old is the universe? ); ethical, with which there is no conflict with science, as it falls outside its scope; and inspirational, over which there is a big question mark – is it possible to draw inspiration from God if you at the same time embrace the doubt of a scientist? And then: politics and science. His thesis is that democracy is like science in that it is structured around permission to doubt – to freely debate whether a decision is correct, instead of having an answer dictated to you. Indeed, if government gives you no freedom to embrace doubt, science will stagnate. And here’s where the politicians need to tune in. He mentions Russia, where science stagnated but technology kept moving forward, for a while, making nice rockets and profits. But then, as the scientific method started to rot and the country went down Lysenko’s path of dodgy inheritance theories, Russia missed out on incalculable economic benefits down the track – by losing the chance to apply theory to agriculture, etc. Crops struggle, people starve, and what once looks like an academic exercise on debating monkeys can suddenly turn into a major impact on the economy. That’s the way science works. No government has the right to decide on the truth of scientific principles, nor to prescribe in any way the character of the questions answered. Neither may a government determine the aesthetic value of artistic creations, nor limit the forms of literary or artistic expression. Nor should it pronounce on the validity of economic, historic, religious, or philosophical doctrines. Instead it has a duty to its citizens to maintain the freedom, to let those citizens contribute to the further adventure and the development of the human race. I think this statement is interesting, not just because it equates art, science, religion and philosophy as valid and precious paths for humanity to try and understand the world around us. It’s also interesting in its historical context. Same with CSIRO, the Canadian NRC, and so on, which brings us full circle. With global CO2 levels reaching 400 ppm this month, we need transparent, public, uncompromised research organisations more than ever. This chapter is the longest, and it’s also more free-range. 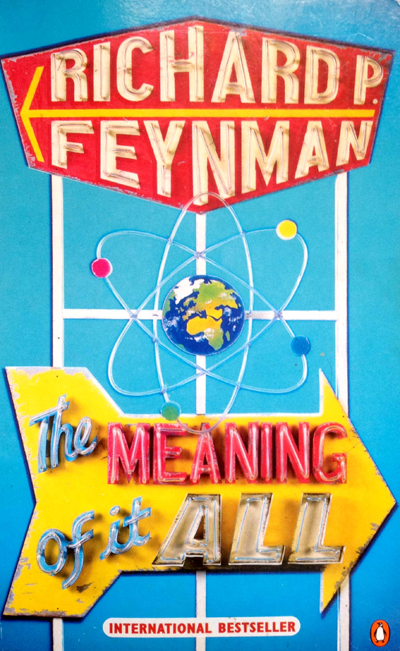 Feynman relates anecdotes, goes on entertaining tangents, and touches on a whole mish-mash of interesting ways science interacts with our day-to-day lives. I’m not going to talk much about it, other than this: if you read it and like it, you’ll love ‘Surely you’re joking, Mr Feynman!’ which you should go off and read immediately because it is warm, wonderful, life-changing and will make you understand why this strange, lock-picking, bongo-playing physicist has a global fanclub. Of course, you’re free to disagree with me. It’s the democratic, scientific way. This book was mostly read in the bath. * In one session, it was half an hour before it dawned on me that a panellist talking about ‘science writing’, who was making statements like “I think it actually helps to have no knowledge of science when you’re a science writer,” was really talking about ‘describing some fascinating animals that exist’. This is part of science – the knowledge, the fruits of the process – but it’s very different to what in my mind is the primary part of science, which is the method. It’s moments like this that Feynman is wonderful to have on hand. When you’re in the middle of a national gathering of science communicators and it starts to seem like everyone is talking about a different thing to you, Feynman is there to tell his stories about teaching energy and learning about birds. Regarding energy (I paraphrase): Do you tell something the motorbike moves because of energy? No. What are they actually learning? To name an abstract thing? How do you possibly respond when they say, “I don’t think it is energy that makes it move.” Instead, you could play a game. “The sun makes it move,” you say. “No, they say, it’s the petrol.” But where does the petrol come from? “Ancient plants.” And what made the plants grow? “The sun.” And now you have a concept of something that starts at the sun and moves down the chain to make things ‘go’. Repeat it for other things and you see it still ends up at the sun. Now you have discovered something interesting!